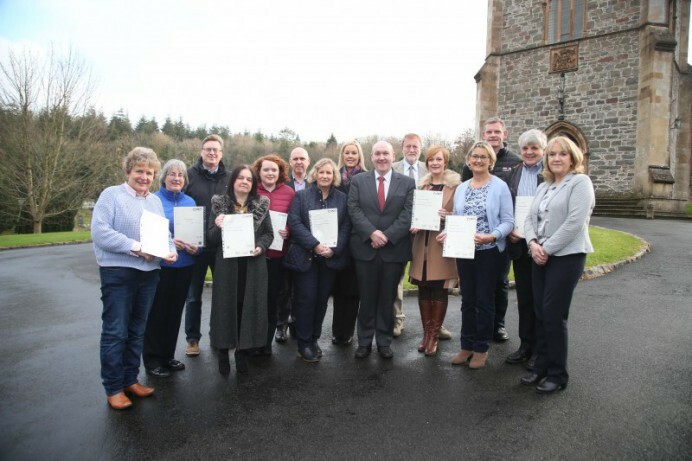 A total of eleven delegates have been awarded OCN NI Level 2 Tour Guide Award certificates after completing a training course in Hillsborough Village. Throughout September and October 2018, Lisburn & Castlereagh City Council provided the course in conjunction with Open College Network, NI (OCN NI) and Travel & Tourism Associates. The course, led by Colette McCafferty of Travel & Tourism Associates, entailed research into the delegates chosen attraction within the village, focusing on Hillsborough’s beautiful architecture and natural spaces such as Hillsborough Courthouse and the Hillsborough Forest. It also provided them with a firm understanding of presenting their findings, leading a group, planning an itinerary and the health and safety issues involved in taking a walking tour. Delegates who took the course ranged from local business owners who recognise the opportunities which tourism provides for the village and surrounding areas, to Hillsborough residents who wanted to share their love of the village with people visiting from all over the world. Hillsborough village attracts thousands of tourists each year and, due to the combination of Council investments in the Public Realm Scheme, the tourism master plan and the development of Hillsborough Castle by Historic Royal Palaces, tourism numbers are predicted to rise considerably from 2019 onwards.